"One of the joys of folktales is that the heroes and heroines come in all shapes and sizes. Those who live by their wits are a remarkable group of characters. This collection of folktales includes memorable examples. In Two Greedy Bears, Mirra Ginsburg retells the Hungarian tale of two affable bear cubs who exist in a state of one-upmanship and who are ultimately tricked out of their cheese by the sly and crafty fox. Their voices are childlike and boastful, and the listener can just picture the cubs posturing and pouting as they try to outdo each other. Their answers in unison to the fox are spectacular, but the fox is triumphant in his final bite. The Karadi tales offer two resourceful animals from Indian folklore. First a young hare, questioning, eager, and crafty, outsmarts the pompous lion who feeds on all the animals of the jungle. Then, a jackal falls in with a pot of blue dye and comes out the wiser, eventually. That a mother and son combination outwit the strange and scary creature of the Southern swamps is the triumph of Wiley and the Hairy Man. Wiley's mother is confident and cunning as she helps her son devise three ways to trick the Hairy Man, and this confidence echoes in Wiley's voice as he faces his nemesis. And the voice of the Hairy Man is just scary enough! There's no doubt that the hero is of exceptional size and capability in John Henry. Denzel Washington is friendly, conver-sational, and collo-quial as he shares this tall tale. Who but John Henry could "bust out of his baby shoes" or drive steel "like it was going out of style"? Since John Henry "couldn't hammer without singing," Washington does, too! Listening to each of these folktales brings great pleasure and the suggestion to use wit and wisdom in our own lives. While listening, be sure to savor the exceptional artwork of Molly Bang in Wiley and the Hairy Man and B.B. King's musical accompaniment to John Henry." 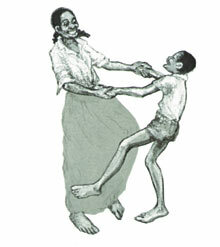 "Narrator Robin Miles brings Molly Bang's version of this traditional southern folktale to life. The story of how Wiley meets and tricks the Hairy Man in the swamp is a favorite of children and storytellers alike. Miles uses separate voices and accents for each character, including the menacing though not too frightening Hairy Man. Background harmonica and steel-guitar music add authenticity and a down-home feeling to the nicely paced tale, which doesn't bog down when page-turn signals are added. Recommended for both school and public libraries." "Wiley and his dogs go to the swamp to cut some bamboo to build a hen roost. His mother warns him to be careful or the Hairy Man might get him. In this adaptation of an American folk tale by Molly Bang (S&S, 1996), Wiley outsmarts the Hairy Man three times. As the legend goes, if you outsmart the Hairy Man three times he can no longer bother you. The first time Wiley tricks Hairy Man into changing into a possum and throws him into the river. The second time Wiley tricks Hairy Man and the dogs chase him out of the woods. Wiley and his mother realize that they will need to be very clever to outsmart Hairy Man the third time. With his mother's help, Wiley tricks the conjure man one last time and they never see him again. The folk music background and sound effects add dimension to the presentation. The narration by Robin Miles is clear, and she uses many different voices to capture the audience's attention. This recording of Bang's suspenseful yet funny book will entertain even the most reluctant readers. School and public libraries looking for good trickster tales will want to add this to their collections."